This was a second wet day, but not seriously so until the afternoon. We set out from Portree shortly after 9 am, and pretty quickly got fed up with the traffic on the main road south from Portree – this road isn’t very nice (except for the splendid scenery wreathed in misty cloud) and seems to be a succession of long drags and descents, perhaps the most notable being that to the Sligachan Hotel and campsite. We first visited Skye on our tandem shortly before the Skye bridge was built, and in the years following the bridge (and the abolition of the ludicrously expensive toll), traffic levels on the main spinal roads on Skye has increased noticably. At Sconser we decided to evade the traffic by turning left at the golf club and quarry, taking a rickety little road round Moll. Previous visits had shown that the road surface had deteriorated badly in recent years, so we were quite pleased that some effort had been made to repair this road. It’s such a minor road that there was no traffic beyond the quarry at one end and the fish farm office at the other, plus the rain ceased briefly so we stopped for a drum up. This brought out our first midgies! On the side road from Sconser, we stopped for a tea break. This is as bright as the weather got! A little further on we rejoined the main road for Broadford. The rain started up again, and about the only thing that kept us going was the sight of the prolific bluebells on the verges. In Broadford we stopped for tea and scones, and met three mountain bikers who we’d last seen on Barra. Also a couple planning to camp, and who seemed to have an optimistic weather forecast for that afternoon. On to the Co-op, where we bought bananas, banana flavoured milk (at last!) and a huge bar of chocolate. 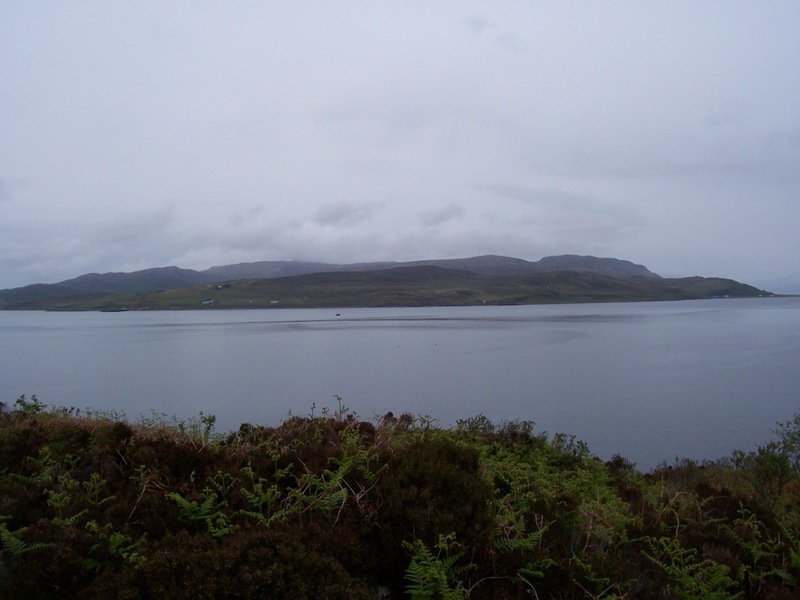 Shortly after leaving Broadford, the rain came on with a vengeance, making the 17 miles to Armadale very soggy. Still, while parts of the new road to Armadale are a bit dull, this is made up for by the woodland in Sleat, with many many bluebells (and wild garlic). We arrived a the ferry terminal with an hour to go, and found it packed with people. It turned out to be pasengers awaiting the Waverley paddle steamer, and once that had departed the waiting room was ours, along with a large number of motorcyclists dripping everywhere. Dinner was very good – excellent moules mariniere followed by hake with a mixed shellfish sauce and braised fennel. C had no starter and had scallops on lentils.